This Chevrolet Corvette Z06 will be one of two cars owned by NASCAR driver Kyle Busch that will sell at the upcoming Barrett-Jackson auction. When you drive for a NASCAR Sprint Cup Series team, your street cars tend to be the same brand as the manufacturer you race for. And if you change manufacturers, you change street cars, too. When Kyle Busch drove for Hendrick Motorsports full-time in the Cup Series from 2005-07, he had access to some hot Chevrolets. But after his move to Joe Gibbs Racing in 2008, he switched to Toyota race cars and Lexus and Toyota street cars and trucks. At the upcoming 43rd annual Barrett-Jackson Collector-Car Event in Scottsdale, two of Busch’s Chevys from his Hendrick days will cross the auction block. The FOX family of channels will have 36 hours of live television coverage from Barrett-Jackson. Busch is selling his Velocity Yellow 2006 Chevrolet Corvette Z06, at the time the top-of-the-line offering in the Corvette lineup. With a fire-breathing, supercharged 505-horsepower V-8, the Z06 was capable of running a quarter mile in 11.7 seconds with a top speed of about 190 miles per hour, which made it the fastest production Corvette to date back then. Serious supercar territory here. Also on the block is Busch’s 1969 Chevrolet Camaro SS, which has been mildly resto-modded. The orange beauty rides on 17-inch, chrome plated American five-spoke wheels and features new paint, interior, tires and brakes. 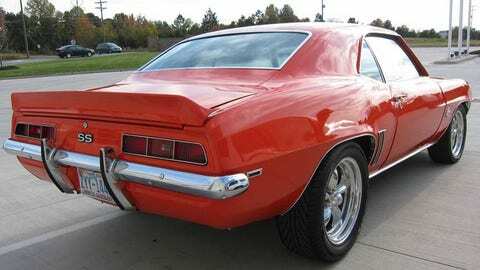 Also crossing the auction block will be Busch’s 1969 Chevrolet Camaro SS. Some lucky collector or collectors will walk away from Barrett-Jackson with two high-performance Chevrolets with a strong NASCAR connection.